Mr. Egbe Donatus and wife, Confidence, woke up with their two children, Joseph and Godwin, on Sunday, March 15, 2014, hail and hearty without an inkling that the hand of a child-snatcher lurked in the shadows. By nightfall, one of their children was gone and a search party would turn up nothing for two good months. Their second child, five-year-old Joseph, had simply vanished without a trace. 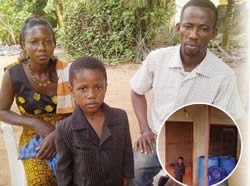 mother, a petty trader, explained that few minutes before he was kidnapped, she came back from church with her two children – Joseph and his elder brother, Godwin. rushed in, bathed and changed my clothes. I came out again a few minutes later and did not see him. I thought he had wandered off to his friend’s house next door. I went there and called him but I got no answer. I went to his friend’s house and they said he had not been seen there either. The residents of Church Village and Donatus' neighbours organised themselves into search parties and knocked on doors. Among the crowd searching for the boy and knocking on doors to enquire if anybody saw the boy, was a friendly and concerned woman called Mrs. Beatrice Iwu, restaurateur, who operates Feed Well Restaurant in the area. But the groups couldn’t find the boy. Punch correspondent spoke with Mr. Fidelis, a prophet, who narrated how he got a call telling him about a lady called Esther, arrested in their village, for kidnapping a child. Immediately Donatus got information about the child, who was then kept in custody of the State Criminal Investigation Department of the Enugu Police State Command, he proceeded to Enugu to see if the child was his. “I got to the SCID in Enugu and the police asked me about my missing child’s complexion, his height and his name. When I told them his name was Joseph, the Investigating Police Officer said the child was not likely to be mine,” he said. Joseph had been given another name, Success, by his buyer, Saturday PUNCH learnt. “But when they brought the child out, lo and behold, it was my child. He ran towards me and hugged me, shouting ‘daddy!’ They asked him who his father was and he pointed to me. They asked him the name I called him and he said Joseph. I wept for joy. They told me everything that happened and how he was recovered. They told me Joseph was sold for N350,000. I begged them to show me the woman who sold her but the police did not,” Egbe said. With an uncanny detail, albeit in a child’s way of speaking, narrated what happened the day he was kidnapped and taken on a long trip to Enugu. From his narration, Joseph’s kidnappers put him in a vehicle headed for Enugu that same day he was kidnapped. He pointed to the house. “When she locked me inside here, a big car came and she put me inside it and we left. The journey was long. The woman told me not to talk inside the car. Donatus' family and residents of Church Village at a point broached the idea of destroying Iwu’s house in retaliation. But after being calmed by the Divisional Police Officer, Mr. Segun Titiladunoye of the Ipaja Police Division, that justice would be done, the residents desisted.